Whenever I volunteer to make desserts for a get-together, I often make more than one dessert. One will be a dessert I think will be appealing to most everyone, and the other will be a bit more "creative." For a recent get together my appeal-to-everyone dessert was Brookie Bars. 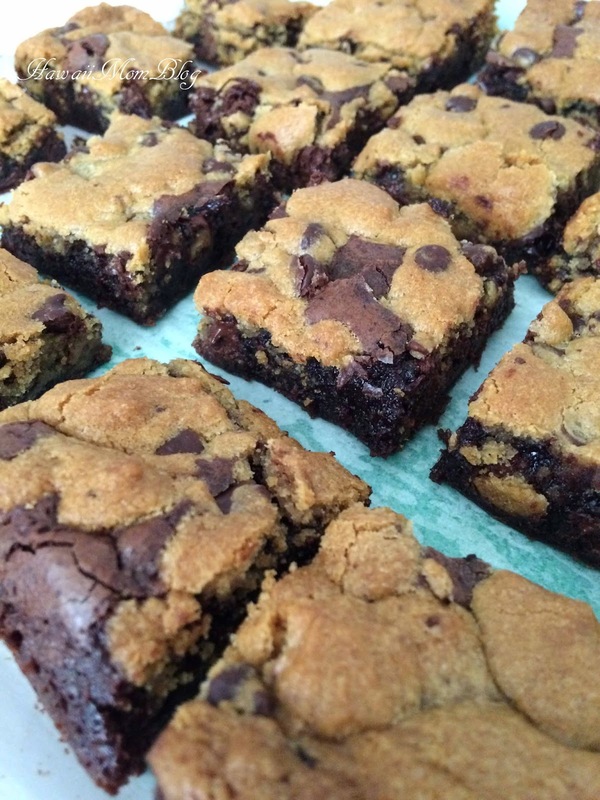 They're basically a brownie and cookie combined (brownie base with a cookie layer on top). They are super easy to make. You can make everything from scratch, or if you're in a pinch, you can use ready made mixes/dough (or a combination) to make a very delicious dessert (and of the two desserts I made for this specific get together, this ran out much faster than the other dessert I made). Pour brownie batter in bottom of prepared 9x13 pan (for thicker brookie bars, use an 8x8 or 9x9 pan). Spread chocolate chip cookie dough evenly over brownie batter. Cool and then cut into bars.